You know those bloggers that, whenever they make a new post and it shows up in your inbox, you just can't wait to read it? Marisa McClellan of Food In Jars is one such person for me. Soon as a new post from her appears in my email, I make a beeline to her site. Whatever new concoction she's dreamed up, it's always intriguing, and it's always good. Imagine my supreme delight, then, when she asked if I'd be interested in reviewing a copy of her new book. Packed with the best of the blog's offerings and so much more, Food In Jars is an absolute gem. As we enter into high production season for all manner of foods put into jars, Marisa's book is resource you will definitely want to have on hand. The photography is sensational and the chapters offer something for everyone. After an introduction outlining the world of canning for newcomers, Marisa delves into jars to fill your entire pantry: Jams, Fruit Butters, Jellies, Marmalade (Blood Orange Marmalade, YES!!! ), Curds & Conserves, Chutneys & Condiments, Pickles, Salsas and Relishes, Tomatoes, Syrups (Blueberry Lemon Syrup, OH YES!!! ), Whole Fruit, Granola In Jars, Nut Butters, and Other Foods In Jars. She's got it all, pretty much soup (-appropriate condiments) to nuts (-butters). 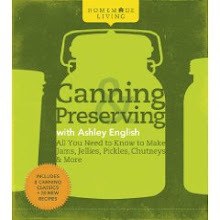 Even as an experienced canner, I found myself learning from her helpful tips, delivered in her characteristic friendly "let's do this!" voice. And the recipes presented here are right up my alley, mixing classics with modern twists. It's a good one, this book, penned by an experienced, personable, true-blue lady. 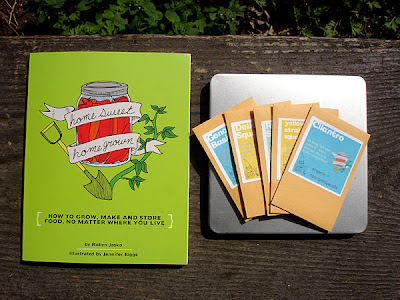 Marisa and her publisher, Running Press, in addition to gifting me with a copy of Food In Jars, have offered one giveaway copy to a small measure reader. How very lucky for you! To enter, simply leave a comment below, listing something you look forward to putting in jars. I'll start. Tomatoes. Plain and simple. We use a TON of tomatoes chez English and just planted 38 of the plants to grow, harvest, and can. If I never purchase another jar of far-away-grown-and-preserved tomatoes, I'll be a very, very happy woman. Please leave a means of contacting you in your comment, should you be the winner. This step is crucial. If there's no link to a blog, or website of your own, or email address in your comment, then I'll sadly have to draw another random number. If you'd rather not leave your email address public, simply leave an anonymous comment and then shoot me a private email with your contact information. I'll run the giveaway for a week, ending at midnight EST June 6th. Even if you don't win, do check out both Marisa's book and her blog. Whether you're already a fan of the water bath or just about to get your lids wet for the first time, you'll be equally smitten. She's got a good thing going on, which will be evident immediately. *Click on any of the images above to make them larger. UPDATE: Thank you SO much to everyone that entered! Anastasia was the lucky winner! Yay!!! These days of mid-spring, they are so very magical, aren't they? Everything is out of the ground, growing up so quickly and giving so much sensory stimulation. We've been out moving and digging and building and watering and planting and so. much. more in the garden, each and every day. I thought I'd show you a bit of what we've been up to. 1) The pea trellis (first and second photos) is going like gang busters. I adore peas, so here's hoping we have a massive crop to eat fresh and freeze for later use. 2) Hubs built these risers to keep the tiny Englishman off of the pots, as he was sort of leap-frogging from one to the next across the garden. These 12 contain our sweet peppers (there are a mess of hot peppers planted in the raised beds; since Hubs would put hot sauce on top of a jalapeno, we can never have too many hot peppers for making hot sauce). 3) We added on to the pea trellis, making a long bed for trellising pickling cucumbers beside it. There's 15 cukes planted there, and another 6 in a raised bed. In a few months, I plan to be swimming in cucumbers, and up to my elbows in vinegar and pickling spices. 4) The raised lettuce beds we made by appropriating plastic bins left by the previous owners (our property used to house an organic flower and herb farm when Hubs purchased it back in 2005, two years before we met). We drilled some extra drainage holes in them so that water wouldn't pool inside when we have serious drenching storms. Having them raised also keeps both slugs and the tiny Englishan from easy access (see #2). 5) We're excited about this sorrel bed. We figured we'd give it it's own space, for perennial purposes. Can't wait to make some sorrel and potato soup and enjoy all that lemony-flavored, nutrient-dense green goodness. There's also been some tomato trellising going on, which I'll share with you soon. And, currently in the works (as in, right this very minute, as he's out there with drill and wood screws and wood planks in hand), Hubs is putting a raised platform and pergola beside Huxley's sandbox. The plan is to put our wrought-iron cafe table and chairs there and grow some native vine-ing edible something or other up the posts, creating an edible shade on top. If you've got any suggestions for something that grows fast, produces prolifically, looks good, and tastes delicious, I welcome your feedback. And I'll post some images as soon as it's photo-worthy. So much work. So much fun. Soon the dog days of summer will be upon us and we'll be ready to just sit out there, watch the chickens peck, the dogs pant, the baby play, and the plants grow. It'll all be worth the dirty work incurred to get it to that place. Happy Friday, friends! We've had an interesting 24+ hours, chez English. Due to a fire at the power substation near our house yesterday (how absolutely terrifying does that sound??? ), we lost electricity around 1 p.m. yesterday. Since our well is electrically operated, we also lost use of running water. To that snafu yesterday, you can add the following: two crone cats that elected to urinate outside of their litter box four times, a rabbit that met an untimely demise by our two dogs after trapping itself in the fenced in area off of our porch, and a financial kerfuffle that blindsided us. Whew. Fortunately, all of those issues have now rectified themselves and the gentle ease that is more characteristic of our daily goings on is returning. Which is fine by me. The glass of chilled wine beside me as I type this is definitely adding to the calm. Which is also fine by me. *You scream, I scream, we all scream for ice cream. *Speaking of ice cream, KC made peach lavender gelato with leftovers from my recipe. *My friend Nicole went to northern California and her visit was a gorgeous one! *10 easy ways to beat weeds naturally. *Yee haw! LA bans plastic bags! *This book looks made for me (and Huxley). *Sophie does it again (the photography is sensational, plus, she's always impossibly lovely!). *Marisa's book is out (look for a small measure giveaway soon!!! ), and it's a good one. *Issue #2 of Taproot is almost here and the preview looks incredible. My little sister, Theo, rolls into town for over a week visit tomorrow. I can't wait to see her! I always love it when my sisters come to visit. Plus, Hubs turns 45 next Friday, and our 5th anniversary is Saturday, so we're thinking of taking our 1st ever date night since becoming parents Friday night. Theo is a super experienced babysitter, plus, well, she's my sister and Huxley's aunt. Win-win! We've been invited to a South African food feast at the home of our veternarian and good friend, Heather Sinclair, tomorrow evening. Sunday will find us in Montreat, playing in the park and celebrating the 3rd birthday of Milo, the son of our close friends Faryn and Eli. Should be a good weekend, more than redeeming the screwy bit proceeding it! Wherever you go this weekend, whatever you do, and whomever you do it with, may it be grand! Not that long ago, I wrote about my feelings of waste here. In short, I loathe it. I'd rather rip up an old flannel sheet and re-purpose it into cleaning cloths, or move the stained rug (thank you cats, again...) onto the porch, or give a beat-up dresser a fresh coat of paint than to ever throw things out. Plastic bags reserve a special place in my waste abhorrence litany. They provoke my ire possibly more than anything else. And so, I try to use them, and reuse them, and then use them again as much as possible when I find myself in possession of them. The handy dandy tool pictured above makes getting them clean in between uses so very easy (you know you can click on the photos to make them larger, right?). Locally made by Branching Out Woodworks, this bag dryer is positioned either horizontally or vertically once assembled. You then simply place your wet (but clean!) plastic bag onto it, wait for it to dry out and then, BOOM! POW! It's ready to be used again. I love this device. It's so simple and yet so genius, all at the same time. To spread the love around, today I'm offering one small measure reader a bag dryer to use, use, and then use some more! To enter, simply leave a comment below telling me some small measure of your own that you take towards reducing waste. Please, please leave means of finding you, should you be the winner, via either a link back to your blog or website, or by leaving your email address in the comments (if you'd rather not leave your email address there, just leave an anonymous comment, and then send me a private email with your information; I've yet to figure out another way of doing this). I'll run the giveaway through next Wednesday May 30th, midnight EST. Together, let's lay to waste plastic bag wastefulness!!! UPDATE: The winner of the Branching Out Woodworks bag dryer is Woolies! Congratulations!!! Thank you everyone for your entries. I loved reading about all of the small measures you're taking towards reducing waste! *Gorgeous light in the cove after a massive downpour. *Chez English in the fading light. *Introducing Huxley to the joys of water jets. *Smallest shot put Olympian ever. *The house down the road Hubs is in love with (built by hand from river rocks!). *Clover, stripes, boots, and grins. Hope your weekend was full of splendor, and may the week ahead be magical! Happy Friday, friends! Firstly, thank you so very much for your kind comments on my grandmother! She's regaining her strength daily and has been coherent for the past few days, an enormous sea change from earlier in the week. Also, I don't know if you've been experienced the storms of spring like we have, but last night we had a rumbler so intense the very foundation of the house shook, the windows wavered, and the dog cowered like the end times were at hand. Huxley loves thunderstorms and runs around yelling "Ton Er, Ton Er" (his word for thunder). That sight alone makes all the risk of the house getting struck by a random lightening bolt worth it. Well, almost. *The cover of Time is getting lots of attention (personally it seems a bit sensationalistic, but then, I guess that's how you sell magazines!). *Pretty much loving all of their clothes. *Pickled beets, I love thee so! *This summer to-do list sounds about perfect. *Rhubarb Fool with Cardamom Cream, ya'll!!! *Details on the great light bulb phase-out. 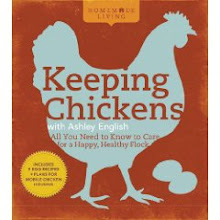 *Keeping Chickens is crazy discounted right now! I've got a post up on Design Sponge today. I'm chatting about making your own signature perfume. It's amazingly easy to do and is a great idea for gift-giving. Tonight we're headed to a little cocktail party of Jen's house, which should be a blast. Tomorrow will find us in Knoxville for the International Biscuit Festival (I. KNOW!!!). I'll be signing books in front of Union Ave Books at 1 p.m., so be sure to stop by and say "howdy" if you're in the area. Otherwise, wherever you go this weekend, whatever you do, and whomever you do it with, may it be grand! *For any new readers, I always post a photo of Huxley on "What I'm Digging" because he's truly what I dig the most. Yesterday, we were chowing down on some Cherry Vanilla Pot Pie left over from a photo shoot. You think he liked it? As I write this, my maternal grandmother (known to myself and my brother as "Nanny" and "Ruby" to the rest of the world) is lying in a hospital bed in the ICU at Mission, Asheville's incredible gem of a hospital. After not feeling so well for a few days, she called herself an ambulance last Wednesday, only to discover she has pneumonia in both of her lungs (or, at least, that was the suspected condition, although that's now being deliberated since being transferred yesterday from the small mountain hospital she was at for the 5 days prior). Early yesterday morning, she had a heart attack, and now has sepsis. Nanny, just like both of my parents, has been a constant in my life. In my childhood, we lived near to each other. As a teenager, when my mom relocated us to the coast of North Carolina, Nanny relocated there, too. And, when my mother moved to the mountains of North Carolina over 15 years ago, Nanny decided the mountain life would be hers as well. Her effect of my career cannot be overstated. She was the first person I ever witnessed can and preserve. She was the first person I knew who kept chickens, or had a garden, or owned a farm. Her tractor was the first I ever knew personally. Until I married and changed my name, I even bore part of her name in my own-we both were "Marie" in the middle. She'll be 87 on August 31st of this year. She's youthful on every level. She tells off-color jokes, flirts with wait staff, and can dance a jig with the best of them. She comes over most Sundays, along with my mom, and plays with Huxley, typically festooning him with some gift or other. He's pretty smitten with her, as is Hubs. Most people are. Our friend Jon was up this weekend, moving the yome he and his wife Jen purchased onto our property, down in one of what we refer to as the "lower fields." As we sat around the fire ring on our patio Saturday evening, roasting marshmallows, sipping wine and ruminating on our roles and lives as parents (his Awynn just turned 2), he mentioned how he's begun taking the "long view", as he called it. Both busy art teachers at private schools in the Atlanta area, Jon mentioned how he often finds himself frustrated at how much he wants to get done, in his garden, his studio, his home, only to find there's just not enough time. He went on to say the expected full lifespan of a human, if they were to live as long as humans can live, was 120 years. Considering that expanse of time, and its length, has helped him to consider the long view, instead of feeling like time is always slipping through his hands like sand. Maybe he won't get as much planted and growing this year as he'd like, he said, but then, hey! There's always next year, and the year after, and then year after that. And next decade, even. If we lived our entire potential lifespan, there's plenty of time to get things done. And, yes, focusing on every moment as the only moment we are promised is important, too, as it forces us to just enjoy and appreciate that opportunity, in all its fleeting glory. But the long view is important also, as it forces us to also be optimistic. We believe the sun will rise tomorrow, the seasons will change, and that the Earth will continue turning on its axis. We believe that life is rich and varied and ever in flux. I'm taking the long view with Nanny. She's lived a wonderful, full life, always in the company of loved ones. Whatever the outcome with her current situation, the present moments I have with her are wonderful, the past ones were formative, and the future ones will be magical, however they materialize. *Here's Nanny at Huxley's Wild Things party, this past October. She's dressed for the occasion and can be seen contemplating eating the entire tray of truffles Dan and Jael brought to share. Apologies for the blurry quality of the photo, but she was in motion! Happy Friday, friends! The rain from earlier this week has moved on and things are bright and sunny outside. Oh, and cool, too! It's cool outside for the first time in weeks. I even had to put on a coat to head out to the chicken coop this morning, and sleep under the down comforter last night! *Oh, Weck shop, you temptress, you. *NPR and Beach House, a perfect union (via Kate). Happy Mother's Day to all you mamas out there! I'm thinking of making Martha's Chiffon Cake with Strawberries & Cream for my mom and grandmother this week. I found a farm selling organic U-Pick strawberries less than 1/2 mile down the road from our house this week. I am over the MOON with excitement about this discovery! The time of gardening is upon us friends! From spring weather-loving crops to those heat-cravings vegetables of summer, the days of seeds and soil and planting and gathering are here. Hubs and Huxley and I have been out in our garden every day, mucking around, getting dirty, and loving it all! While I've been gardening for some time, there's always so much more to learn. The gardening and growing learning curve is so very steep, and long, it seems, perhaps owing to the variability of successful techniques from region to region, climate to climate, and even one growing season to the next. Adaptability and an "oh, well!" disposition are essentials in gardening, just as much as good gloves, compost, and a trusty trowel, I've decided! To help me, though, and you, too, thankfully we've got Robyn Jasko. 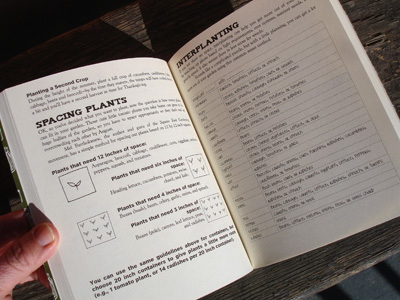 Introduced to me via my buddy Jodi (proprietress extraordinaire of Asheville's beloved Short Street Cakes), Robyn has just published a lovely little book on how to grow, and grow well. Home Sweet Homegrown takes your hand and lovingly walks you through the entire growing spectrum, from seed-starting to sowing to harvesting all the way up through cooking and even preserving what you've grown. It's compact enough to fit in your the back pocket of your gardening jeans, but dense enough to become a go-to source time and time again. 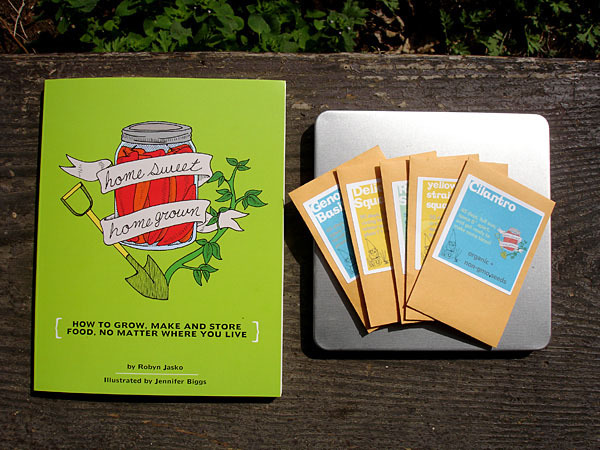 Robyn and her publisher, Microcosm Publishing, have generously offered two small measure readers copies of her book, along with the 5-packet seed kit pictured above. How cool is that?! All that's needed to enter the giveaway is a comment saying what you're looking forward to growing. For me, it's pumpkins. I have 6 varieties started and I can't wait to bake, carve and decorate with them come Autumn. YES! I'll run the giveaway through next Wednesday, May 16th, midnight EST. In your comment, please leave a means of reaching you should you be the winner(s), via a link back to your blog or website or by leaving your email address in your comment (don't forget this essential step, folks! I've had far too many numbers selected by the Random Widget only to find there's no way whatsoever of reaching the commenter!). 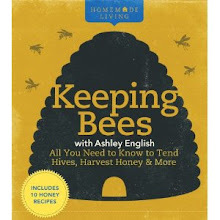 Even if you don't win, do check out Robyn's book and her website, growindie.com. This lady knows what she's doing and has got an enormous amount of seasoned gardening wisdom at her (dirty!) fingertips! Thank you, Robyn, and thank you Microcosm! I love considering other ways of being, of doing. When we were visiting Amanda in Maine this past March, at one point our conversation turned to schooling and education. She articulated her views on the importance of presenting children with different ways to living one's life, that the path from point A to point B, in terms of career and livelihood and education, needn't be always the same one, that there's a multiplicity of ways to achieve what you want in life. Those sorts of "Well, what about?" or "Have you ever considered?" ways of thinking always grab me by the throat, pull back my cranium and make me realize that there are so, so very many different ways of living and doing and thinking on this lovely planet of ours. Which is wonderful, and challenging, all at the same time. I think about those alternate views often. The way I parent my child, though similar to that of many of our close friends, is wildly different from many. The vocation and manner of our livelihood is unusual for many. And I think, underneath it all, is a pervasive love of "wildness" that calls to Hubs and I so very strongly. We love wild, open spaces. We love wild, open thinking. We love wild, uncultivated foods. The idea of spaces and mindsets and foods untouched and unbound by human hands calls to us on a very core level, so much so, that it's our son's middle name, Huxley Wild English. And so, owing to this love of wildness in all of its permutations, when Hubs recently gifted me with the book above, I couldn't have been more elated. The Wild Table: Seasonal Foraged Food & Recipes is stunning, and inspiring, and everything a good cookbook should be, in my estimation. It traverses the calender year (and even includes "Indian Summer", which is pure genius). Foraging huntress Connie Green and chef and culinary consultant Sarah Scott are highly innovative while inherently primitive, all at once. The book is teeming with forest-to-fork recipes (Hedgehog Mushroom and Caramelized Onion Tart? Yes, please! 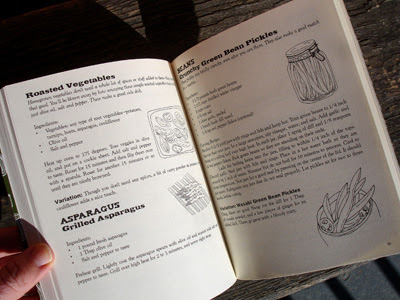 ), while also packed with stories, essays, tips and techniques for turning 40 mushrooms and plants into fresh and preserved dishes. Hubs scored this gem at the bookstore in the Screen Door. 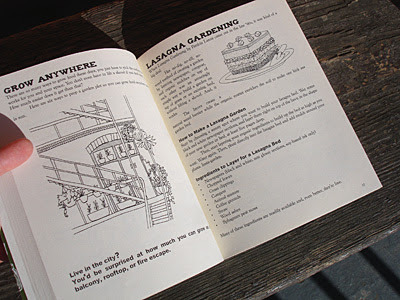 Locals, if cookbooks or gardening books or children's books or decorating books and saving money are your thing, you must go there, immediately. The deals to be had in that store are jaw-dropping. I heard mention today of fiddlehead ferns 'a plenty nearby. There's also two big patches of woodland nettles on the way to the chicken coop begging to be rendered into pesto. And before too long, the wild wineberries on our property and the wild blueberries along the Blue Ridge Parkway will be ripening. I can't get enough of it! Let the wild rompus begin! We'd planned to host our lovely friends, Jen and Jon, of Decatur, Georgia this past weekend, along with this adorable 2 year-old daughter, Awynn. At the last minute, we discovered Jon had come down with a fever (last I heard there were suspicions of strep throat, which has been rampant around these parts recently). Poor guy! And so, their visit has been postponed by a week. Our friends Mark and Maia, of Chapel Hill, N.C., and their two amazing kiddos, Roan and Wilhem, were in town, also hoping to see Jen and Jon (we're all old college buddies). We decided last minute to stick with the plan, and include our other mutual friend, Dan, in chatting and noshing chez English. The best part of the resulting meal Saturday evening, aside from the wonderful times that are always had in the presence of beloved friends, was just how inherently collaborative it was. Dan picked chard and leeks from his garden and brought them along with a bottle of N.C.-grown wine, while Mark and Maia brought some hummus, pita, cucumber, grape tomatoes, Greek yogurt and feta cheese. Hubs took their offerings and incorporated them into what ended up feeling like a Mediterranean-by-way-of-Provence feast. He added chicken, Niman Ranch sweet Italian sausage, green peas, the tomatoes Mark and Maia brought, Dan's chard, wine, chicken stock, olive oil, olives, capers, lemon juice and zest, cremini mushrooms, Herbs de Provence, Greek spice blend, fresh marjoram, garlic, rainbow carrots, and onions (those last two ingredients came from Mother Earth Produce, a local multi-farm CSA that I've been writing for lately). All of that went into a cast iron serving dish, cooked on the stove and served right out of it, sprinkled with feta and fresh mint on top. He also chopped up the cucumber (or maybe Dan did?) and mixed it with the Greek yogurt Mark and Maia brought, adding in some fresh dill and mint from our garden for a quick tzatziki sauce. The leeks were cooked down in butter, a kiss of sugar, chicken stock and wine until they were browned and sweet and creamy and utterly delicious. We dined al fresco, with wine and pita and hummus and kids and birds chirping and dogs running. It was amazing, and really felt like an unofficial kick-off to the languid warm weather days of food and friends on the horizon. We're all in this together, this life, this journey, this wonderous experience. When we come together and literally bring different elements to the table, we enhance our time together ten-fold, I feel. Food, friends, family, and fellowship. It doesn't get any better than that. My Small Measures post is up over on Design Sponge. This week I'm chatting about making several all-natural, inexpensive, supremely easy cleaning products. You can read the full post here. As I mention in the post, whenever we've used up the contents of an attractive bottle, we give it a thorough sanitizing wash in the dishwasher and then store it away for later use. We've got a basement with a wall of built-in wood shelves in one corner that's perfect for this purpose, but, lacking that, you could store yours in a pantry, or even in a linen closet. The bottles come in handy for gift-giving purposes like homemade infused vinegars, as well as for prettying up homemade cleaners. It's a great way to upcycle both bottles and spray nozzles alike. What about you? Do you make any of your own cleaning products? I'd love to hear your DIY solutions for greening up your clean up. Happy Friday, friends! We've been working hard in the garden this week, getting all sorts of goodies planted and watered and gloriously growing. So wonderful to see it all flourishing. I'll take some photos of different planters we've built out there recently and share them with you soon. A gaggle of friends is due out here tomorrow evening, to make tacos and drink libations and play with our collective kiddos together. It should be a good time! *Love this simple to build greenhouse. 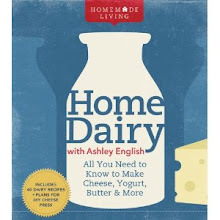 *Making homemaking legit (with a quote from yours truly). *6 riffs on the Mint Julep. *These color palettes are exquisite (Love the nature-inspired ones, especially). *Even more reasons to love asparagus (it's prime time for the stalks, folks). *Strawberry freezer jam (made with honey & white grape juice!). *Our roses just bloomed and I'm thinking of giving this a go. We're off to the annual Asheville Herb Festival in a bit. Locals, you should definitely check it out. We've got most of the culinary and medicinal herbs we want, but one thing we're on the hunt for this year is sorrel. We want to plant a good bit of it so that we can pick that lemony goodness again and again! Oh me, Oh my, Oh Pie! You know when you work, and work, and work (and work and work and WORK!) on something and then, suddenly, it's done, finished, fully completed? And it feels so, so very good, right? Well, that time has come. 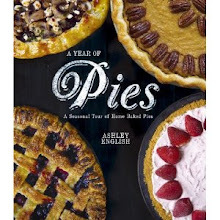 I am over the moon thrilled today to share with you a little sneak peek of my new book, A Year of Pies: A Seasonal Tour of Home Baked Pies (Lark Crafts, 2012). The idea for this book was presented to me when Huxley was only 6 weeks old. I started writing it when he was 3 months, turned in the manuscript when he was 9, polished off the last of the photo shoots when he was 13 months, and now, have a real world, in-my-hands copy to show you today, when he's just over 1 1/2 years old. Clearly, the growth of this book paralleled my growth as a mother and my son's growth from newborn to infant to toddler. And what an amazing journey it has been. This book is such a joy to me. Not only does it cook as I cook, through the calender year, but in it you'll also find contributing recipes from 8 of my favorite blogging buddies, including Beatrice Peltre, Aran Goyoaga, Amanda Soule, Jenna Woginrich, Kate Payne, Tim Mazurek, Jessie Oleson, and Tricia Martin. There are sweet and savory pies. There are hand pies and galettes. There are lattice-top and double crust and freezer and fridge pies. There's truly something for everyone, including 3 gluten-free offerings. The book publishes August 7th, but is available for now pre-order (and it's discounted some kind of crazy on Amazon!). I can't wait to share more with you closer to the publication date. For the time being, though, know that this book was made with lots of love, lots of baby giggles and shenanigans underfoot (and oftentimes, on hip, as in, he was on my hip while I was prepping pastry dough or mixing fruit with sugar in the mixing bowl), and lots and lots of butter. I hope that that love pours off the book's pages and into your home, a little slice of light and laughter and bliss, from me, to you. Almost forgot, I've got two more bits of pie-inspired writing for you! On Verve, I'm chatting about how pies have shaped my life and on Mrs. Wages, I've got two berry-centric recipes up. Enjoy! We had SO much fun at the Slow Food Asheville sponsored Cake Walk this past Sunday. Hubs even won a scrumptious cheesecake from Rachel's Delectables. My mom and grandmother joined us at the event and Huxley showcased his best moves for the crowd (he's crazy about dancing; I'm thinking some music and/or dance lessons are in his near future). Locals, I highly encourage you to get involved with Slow Food Asheville. The local chapter regularly hosts fabulous events that are just as informative and educational as they are festive and fun. I think the cake walk is an absolutely genius concept. Originally employed by southern plantation slaves, the activity involved dance moves mocking the more formal ballroom style used by slave owners. Dancers would move in exaggerated steps and, at the end of the competition, whomever was deemed the silliest dancer was awarded a cake. Today's cake walks are more like musical chairs than their historical forebears. Dancers walk in a circle (although I typically dance my way along!) to a musical accompaniment. Along the circle are numbers, often written in chalk. When the music stops, dancers stand over the number they landed on. Whoever is orchestrating the cake walk then randomly draws a number and the dancer/walker standing over the chosen number is the winner and bestowed with a cake. All of the cakes at Sunday's event were locally made by Slow Food members or area businesses. As much fun as these modern cake walks are, I want to bring back the cake walks of yore. I'd love to witness my nearest and dearest attempt to outdo one another with the wildest, wackiest dance moves they can conjure. I've got a number of gatherings planned over the next year (all work for my new book-stay tuned for more details!) and I'm thinking the cake walk will make a cameo or two. At our cake walks, each attendee would bring some item to be given away to the winners. Ideally that would be a cake, but I know that not everyone feels their baking chops are prize-worthy. So, the prize could be a batch of their amazing brownies, or their stellar homemade granola, or even a 6-pack of local beer. We'd dance, we'd make fools of ourselves, and then we'd be awarded for it in the end.